How do you exact revenge on an inanimate object? That is the question facing the characters in Mike Flanagan’s Oculus. The team behind Sinister and Insidious return with Doctor Who's Karen Gillan and newcomer Brenton Thwaites as two siblings, Kaylie and Tim, attempting to exorcise a haunted mirror which appears to have the power to compel people to commit violent acts. The movie is, apparently, a feature-length development of a short film Flanagan made in 2006. The movie begins when Kaylie collects her brother from a mental hospital where he has been ‘cured’ regarding his delusions about the supernatural aspects of the mirror, and she promptly informs him that they must keep the promise they made as children to destroy the evil that lurks within the mirror that caused their parents to lose their mental stability and wreak gory havoc. Her ‘sane’ brother is, understandably, a little taken aback by her greeting and unwilling to enter into the world of his former trauma. Nevertheless, Kaylie steals the haunted antique mirror, setting it up in the family home as the focus of an array of cameras, temperature gauges, alarm clocks and a giant swinging blade designed to ultimately destroy it. However, before Kaylie is willing to put an end to the mirror's unholy dominion, she wants to document and prove its power, thus exonerating her parents from guilt. This is a bad idea. Director Mike Flanagan shifts the timeline from 11 years ago (starting with the obligatory happy-family-moves-in-to-new-house montage) and back to the present day - and then pulls off the more impressive trick of occasionally having the 23-year-old Kaylie and the 21-year-old Tim crossing paths with the younger version of themselves as children reliving their trauma. The haunted mirror plays tricks on its victims' minds, and has destroyed dozens of lives over the years, such as the time a mother thought she was tucking her children into bed when she was, in reality, drowning them in a cistern. Flanagan takes the opportunity of turning the fragile and pliable nature of consciousness into a fear tactic, which works better than merely visceral shocks. Soon, none of the events that seem to be happening can be taken for granted, including Kaylie and Tim’s own behaviour, and we as the audience are inevitably subjected to the mirror’s illusions along with the protagonists. The mirror is messing with the characters minds at every turn - and, by extension, it’s messing with us -"You see what it wants you to see", as the tagline goes. 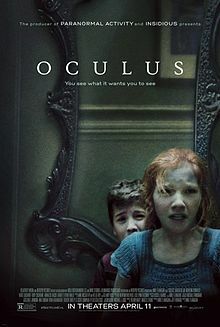 The narrative freedom inherent in this premise allows for some vivid visual images and for the entirety of Oculus, the narrative cuts back and forth from the adult pair's efforts to destroy the mirror, to what happened to them as children, when (with far too little set-up) their dad (Cochrane) goes off the mental rails and mom (Sackoff) is the inevitable victim (read Amityville Horror or The Shining). The flashbacks in Oculus have a depressing inevitability because we are told who will live and who will die early on, and this has a tendency to turn scenes into an exercise in jump-shock or gore. The lack of suspense is more disheartening when one realizes that the holes in the flimsy storyline haven’t been filled by any sort of social context or explanation as to why the mirror is the way it is. Nothing particularly new is being done with these horror tropes, and there are no self-conscious postmodern twists. Oculus eventually becomes little more than a series of ghostly figures and twisted visions on its way to a disappointing ending that you'll see coming early on. It is when Flanagan and co-writer Jeff Howard offer the vague possibility that Kaylie may actually be crazy, that Oculus is most intriguing. Past and present begin to merge as this pair of unreliable narrators wander through memories, attempt to distinguish between illusion and reality and try to act faster than the mirror can anticipate. What is different about the movie is its structure, which cuts back and forth between Tim and Kaylie in 2012 and their experiences 11 years earlier. Because both timelines take place in the same domestic space, Flanagan is able to create a number of eerie visual parallels – mirror images, even – between past and present (Flanagan also edited the film himself). The pervading sense of ambiguity is distinctly cinematic, forcing viewers to question whether any given moment is actually taking place. Unfortunately, the final act of Oculus becomes an increasingly random series of scenes designed to push fright buttons instead of offering anything inherent to character or narrative. If there are no rules or relatable subtext within the world of a horror film, the images have a diminished power to shock. Flanagan is a gifted filmmaker, but seasoned horror movie buffs will perceive that the film only reflects many of the visions of the skillful thrillers that came before it. The script says the haunted mirror was once in Balmoral castle, and was presumably the property of the royal family. What havoc did it wreak? There, my friends, you have the plot for Oculus 2. Copyright R.H. Zelen – ©RenZelen 2014 All rights reserved.